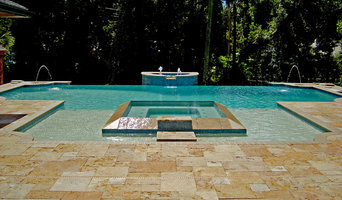 Florida's Custom Pool Specialist 3x Best of Houzz Winner! Signature Pools Inc. is a custom, luxury swimming pool contracting company in the Orlando metro area. We are a full service pool design, swimming pool construction, pool renovation, pool remodeling, pool maintenance and pool repair swimming pool company, serving homeowners and home builders in Orlando and throughout the entire Central Florida area. 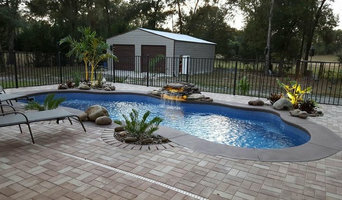 With over twenty-seven of satisfied and happy customers, and as members in high standing of the Better Business Bureau and the Florida Spa and Pool Association, we pride ourselves on our unique pool designs, superior construction and reliable pool service. Whether you require the services of our award winning, complete design and construction department or you require a simple weekly pool maintenance package, Signature Pools, Orlando, is your single source for all your pool needs. Dixie Pools & Spas, Inc.
CL Industries is the world leader in exposed aggregate pool finishes, deck coatings and building materials for the commercial and residential pool industry. For more than a quarter of a century, CL Industries’ experts around the world have been dedicated to providing customers with innovative, stylish and enduring pool, spa, deck and waterscape designs. Having been at the forefront of innovation within the pool finish industry, the CL Industries team has played a key role in the development and innovation of the products used today. In the early days of the industry, the primary product for pool finishes was a simple marcite mix…CL Industries realized the opportunity to create/invent a more dynamic product offering (polished finishes, quartz finishes, & pebble finishes) to ensure greater longevity, beauty, and multi-purpose functionality. The evolution of industry standards and product portfolio can be greatly attributed to the combined experienced of our team and their dedication to research & development. Artesian Pools is proud to be one of Central Florida's largest and oldest in-ground custom pool and spa builders. Family-owned and operated, Artesian Pools has the experience and reputation that everyone deserves. You can visit our showroom open 6 days a week to see 3 full size pools with the latest, decking, tile and water features on the market. Artesian Pools has the experience of building over 16,000 pools in the area, and the dependability of 40 years in business under the same management and in the same location. Artesian's solid reputation for innovative design, precision engineering, quality materials, and meticulous workmanship makes us a leader in the industry. Artesian means quality… from start to finish. Australian and New Zealand pool builders continue to push the boundaries in terms of design. Infinity pools, for instance, are no longer reserved for top-end holiday resorts; and lap pools aren’t standalone additions to a backyard. You can now get your feet wet in an infinity pool, lap pool or swim spa that is an integral part of your Orlando, FL home design. And, with improved technology, there are more low-maintenance, energy-efficient and sustainable options available. Whether you’re at the beginning stages of planning a pool or spa, renovating an existing one, or just need upkeep assistance, there’s an Orlando, FL pool specialist on Houzz who can help. After council approval, your contractor will commence construction, which can take up to two weeks for a fibreglass pool and longer for a concrete pool. Some companies in Orlando, FL extend their services to pool fencing, landscaping and the coordination of trades for filtration and heating equipment, as well as pool cleanings, water testing, renovations and equipment replacement or repairs. Here are some related professionals and vendors to complement the work of pools & spas: Garden & Landscape Supplies, Landscape Architects & Designers, Building Project Managers, Landscape Contractors & Gardeners, Solar Power Contractors. Find an Orlando, FL swimming pool and spa expert on Houzz.